This is a really fast and delicious dinner that you could make in under an hour. I actually made it on a weeknight when I came home after 8pm and finished eating it before 9pm, which is pretty unbelievable. Both recipes came from Ina Garten's Back to Basics cookbook. 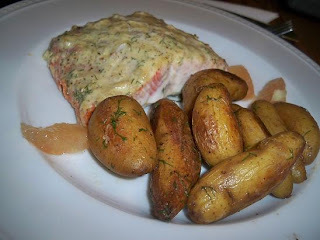 The fish that I chose was a salmon instead of the red snapper that the recipe called for. You can use virtually any fish that you like and I usually pick whatever is fresh (aka Whole Foods' catch of the day). I left the skin on the salmon, which kept it nice and moist. The mustard sauce was creamy, tangy and felt luxurious but not heavy. I didn't get too full from it, which was good because I was eating late at night. Unfortunately, I had to eliminate capers, not because I don't like them but because I didn't have any. As you'll see from the above picture, I added slices of pink grapefruit next to the salmon--to freshen it up a bit and to bring some citrus into the equation. Overall, it was a super easy dish and I couldn't believe that it only took about 10 minutes to bake. A hands-off side, I liked that I could leave it in the pot without doing much. I followed directions to the T and didn't have to alter anything. I figure that you could prepare any type of potatoes with this method but fingerlings are nice because they are small--it would take a lot longer to cook regular sized potatoes. An interesting suggestion might be to also add veggies to the mix such as onions, carrots or red peppers. Try these recipes on a weeknight or on the weekend--whatever strikes your fancy.